The results of the study demonstrate that the companies of the examined industries already operate heavily internationalized supply chains today. The majority of the companies plan to globalize their procurement, production and sales activities even more in the future. Based on the “global footprint” and its expected trends and other variables, GEXSO examines the manifestation of the planned internationalization of companies in the countries Germany, Austria and Switzerland. Leading economists confirm the meaningfulness of international expansion, which is also highlighted by the status quo of the companies’ network structures. GEXSO records and qualifies the measured internationalization degree of the examined companies based on various parameters and provides a forecast of upcoming changes for global network structures. For a complimentary examination of economic internationalization, the globalization model developed by GEXSO classifies the current state of procurement regions in categories in order to facilitate their assessment. This chapter summarizes the identified, measurable characteristics of internationalization and depicts them as globalization variables. Amongst others, already globalized product infrastructures can be driving factors for further international expansion. This often results in a shift of procurement volume and a geographical re-positioning of the supplying industry. An international customer base can lead to the globalization of the production infrastructure. GEXSO observed that many companies follow a localization strategy: first they adjust their production infrastructure according to demand, then they develop local suppliers, whilst shifting large parts of the total procurement volume to the production regions. The “global footprint” illustrates the results of previous chapters in a compressed version. Currently 65.6 per cent of suppliers, 60.6 per cent of procurement volume, 41.2 per cent of production sites and 51.1 per cent of customers are located in Western Europe. Particularly the automotive supplier industry operates remarkably global today. Especially notable is the wide global distribution of its production sites. Only 35.3 per cent of the production sites in the automotive supplier industry are currently located in Western Europe. 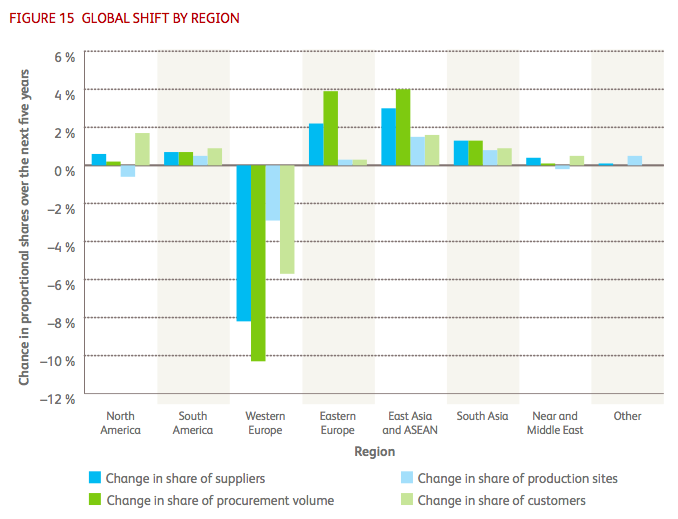 Different regions are generally of varying importance for the sectors’ sales, production and procurement. Compared to sales and production, there is a proportionally higher concentration of procurement in Western Europe. In North America, production and sales are comparably more important than procurement. The current regional distribution of active suppliers demonstrates that these are generally geographically centralized, whereas the production network of the companies has clearly globalized structures. Therefore, coordination procedures at the interface between procurement and added value are essential. The globalization process will continue to advance further in the coming years due to a growing demand in the emerging economic markets and an increasing proportion of international customers. As a result, a considerable proportion of supply chain resources will be located in the growth regions. The results of the study confirm an expected change within the next five years. Summarizing the previous chapters, GEXSO expects an increased globalization for all examined company sectors. This results in an increased global reach for the companies and renders adaptions to new requirements and implemented network structures necessary. The graph depicts how the relative proportion of e.g. the procurement volume for individual regions increases or decreases. Therefore, we can predict a change from currently 60.6 per cent to 50.3 per cent in five years (10.3 per cent). On closer inspection it becomes evident that the procurement volume in East Europe and East Asia is growing faster than the proportion of suppliers. In South Asia these two figures grow equally fast. These dynamics also affirm the possible existence of localization strategies within the interviewed companies. The increase of the relative proportion of international procurement volume, with a simultaneously slower increase of suppliers, also confirms the hypothesis that local suppliers were developed, while the companies shift large parts of the total procurement volume to the production regions. In the following chapter, “globalization degree”, GEXSO determines the degree of globalization based on measurable parameters from procurement, production and sales. The previous chapter discussed the expected development of the global distribution of suppliers, procurement volume, production sites and customers in different world regions. We determined that an increasing globalization is expected for all recorded parameters. This progressive internationalization will now be quantified. For this purpose, we will look at the differences between global and local shares in procurement and sales. In terms of production we will look at the relation between international production sites and those who are located in the home region. Together, the findings will offer an interesting insight into the internationalization strategy of the examined industries. More than two thirds of the companies conduct at least 30 per cent of their procurement outside of the home region. 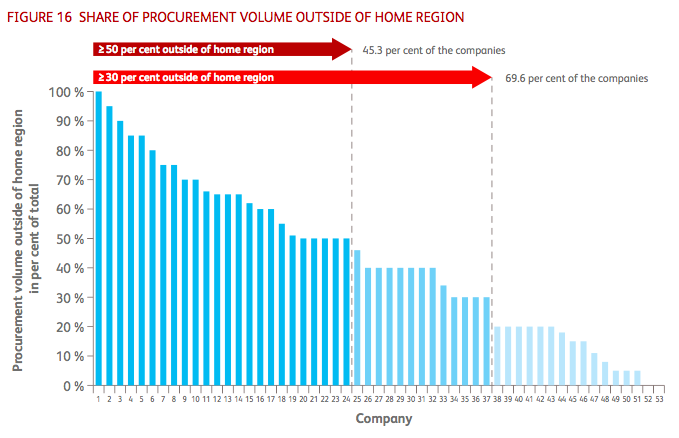 45.3 per cent conduct less than half of their procurement within their home region. This global focus within the procurement sector will increase even more within the next five years. On average, a larger proportion of the procurement volume will be processed outside of the home region Western Europe. 73.6 per cent of the companies plan to increase their proportion of international procurement, while only 5.7 per cent predict a relative focus on the home region. 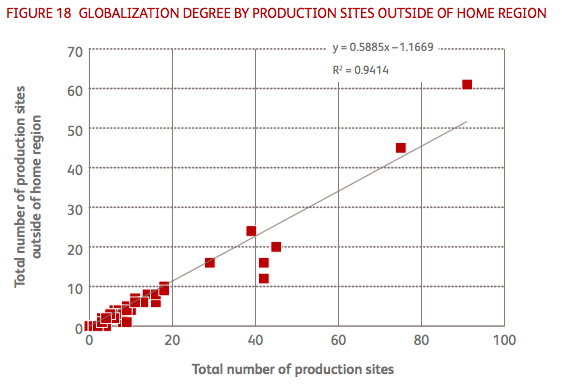 The following graph illustrates a clear connection between the companies’ total number of production sites and the number of production sites outside of their home regions. The slope of the straight line indicates that regardless of their size, companies from all industries operate an average of approximately 58.9 per cent of their production sites outside of their home region. Therefore, with high significance (measured RC of 0.94) the companies pursue a similar strategy when globalizing their production sites and strive to achieve a balance between their production sites in the home region and in other regions in the world. However, an industry analysis demonstrates distinct differences. With equally high significance and in the same way, a global linear function can be derived for the automotive supplier industry, the machinery and plant engineering sector and the industry component manufacturers. In the automotive supplier industry, for every production site in Western Europe there are 0.62 production sites outside of the home region; in the machinery and plant engineering sector this figure is 0.61; and in the industry component manufacturing sector it is 0.54. There is a certain amount of consensus on an appropriate pace for globalization and on the balance between international and home locations. However, compared to the other industry sectors, industry component manufacturers operate more conservatively and with greater emphasis on their home base. As expected by GEXSO, the analysis of future scenarios revealed that the globalization degree, based on the relation between the number of production sites outside of the home region and the total number of production sites within the production network, will increase further in the next five years. 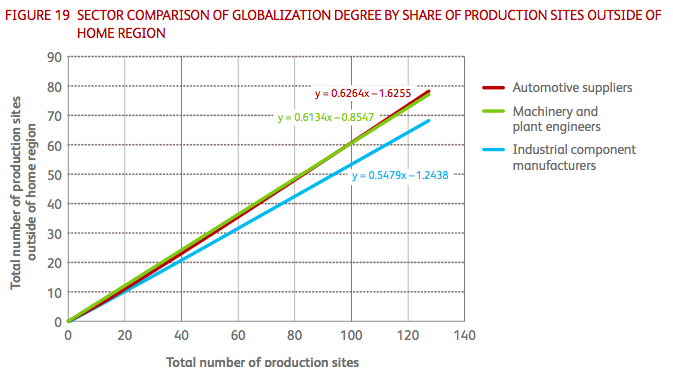 The following graph shows the increase of international production sites in percentages. The vertical axis depicts the proportional increase of production sites outside of the home region, while the horizontal axis displays the companies anonymously. A total of 37 per cent of the companies forecast an increase of internationally operated production sites. Only five companies expect the globalization degree to decrease. In 53.7 per cent of the companies it is expected to remain relatively stable in the next five years. Generally, it is expected that the production networks, in which 58.9 per cent of the production sites are operated outside of Western Europe, will be further globalized in the next five years. 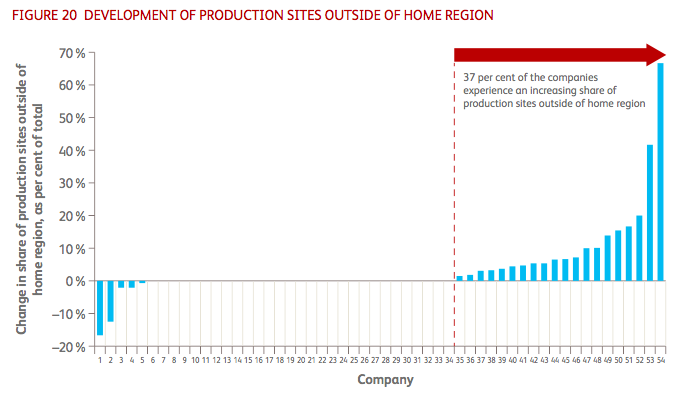 In the future, an average of 59.9 per cent of production sites will be located outside of the home region. The analysis of the “global shift” illustrates that companies are currently undergoing an ongoing globalization process that will continue to affect the production infrastructure and lead to a larger amount of international production sites. An evaluation of the global distribution of customers forms the third and last component of the quantification of the companies’ current and future globalization. 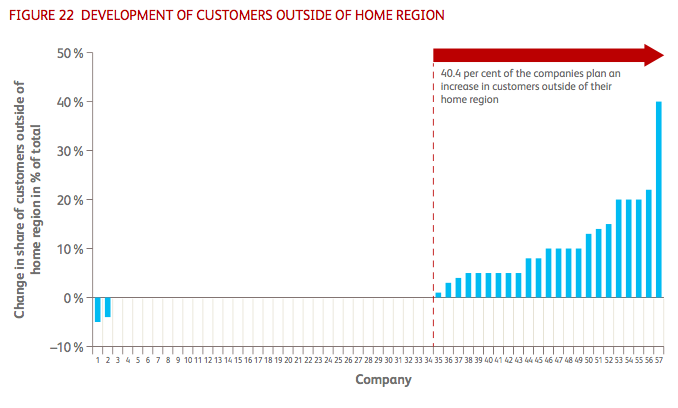 Similar to the evaluation of the procurement volume, the relative proportion of customers is compared to the number of customers within the home region Western Europe. The graph effectively shows the amount of companies that already have a large proportion of international customers. 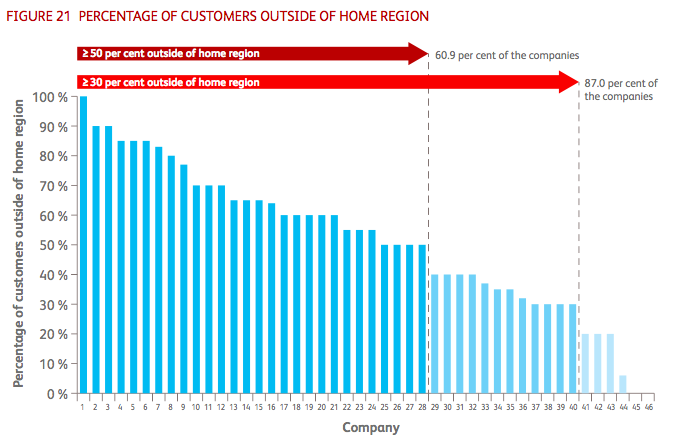 At least half of the customers of 60.9 per cent of the interviewed companies are located outside of the home region, while 87 per cent of the companies serve at least a third of their customers in other regions. This situation will intensify in the near future and promote a progressive globalization of the entire supply chain. As expected, the geographic distribution of customers will also proceed to be globalized further. 40.4 per cent of the interviewed experts observe a globalization of the customer structure, while only two companies note a relative concentration of customers in Western Europe. On average, the international proportion of customers will increase from currently 50.9 to 55.3 per cent (4.4. per cent). 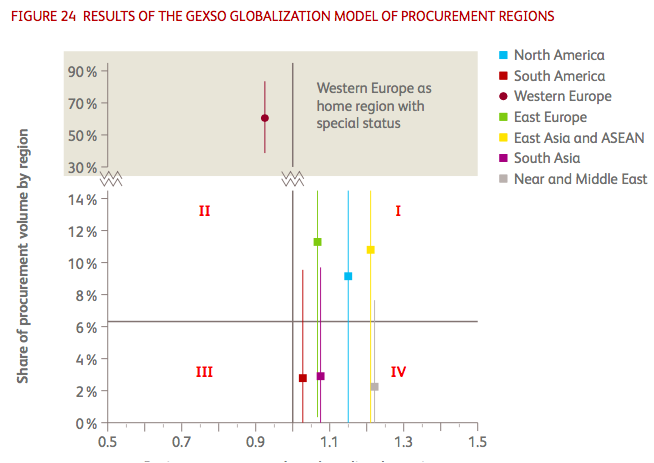 With the help of a globalization model GEXSO examines the companies’ different procurement regions and their importance within international context. The following chapters will discuss differences between the procurement markets. The model considers two variables: the proportion of procurement volume and the proportion of suppliers per region. The vertical axis depicts the proportional procurement volume of a region in percentages, while the quadrants are divided by the median. 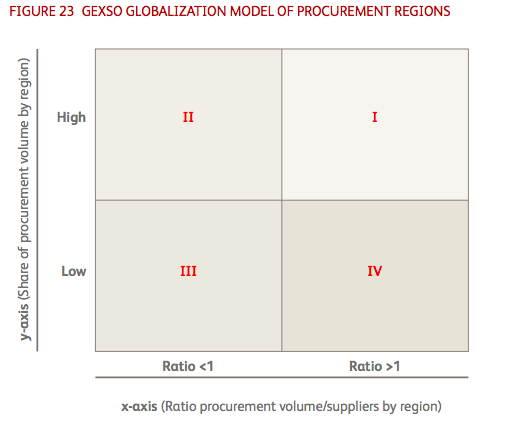 The horizontal axis represents the relation between procurement volume and suppliers within a region. Thereby, possible manifestations on the vertical axis can take on figures from 0 to 100 per cent. The horizontal axis can display all figures that are larger than 0 – due to the results of the study it has a maximum value of 1.2. Regions within the first quadrant have a larger proportion of procurement volume than their proportion of suppliers. 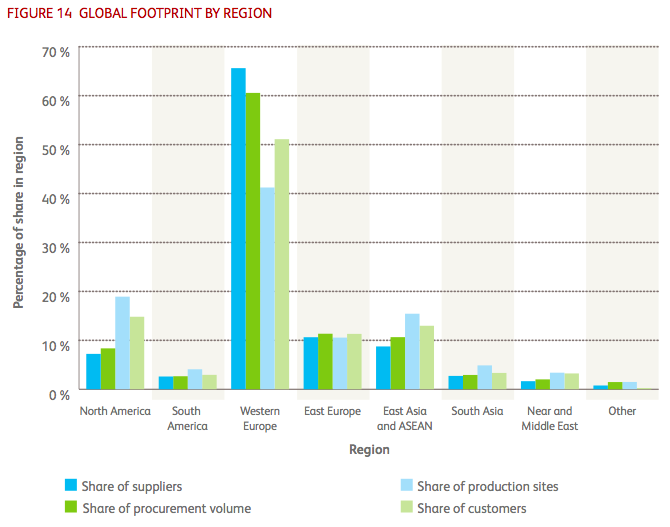 Simultaneously, these regions have a comparatively large proportion of total procurement volume. In contrast, regions in the third quadrant have a larger proportion of suppliers than their proportion of total procurement volume. 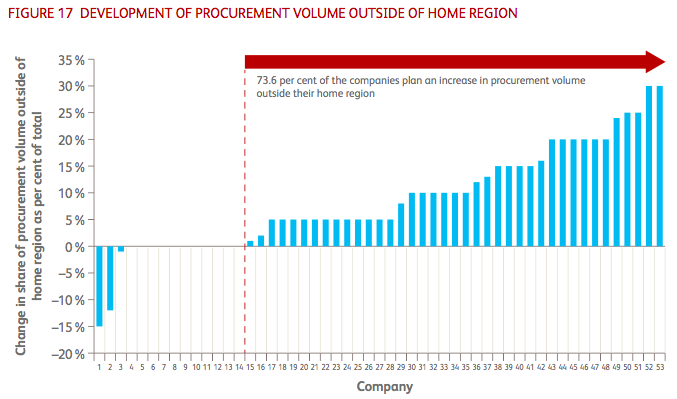 The second quadrant includes a large proportion of procurement volume but even more resident suppliers. Conversely, the fourth quadrant features a small proportion of procurement volume and few resident suppliers. A regional comparison illustrates the current situation. Procurement regions are often dynamic and change with time. It is very possible that a region leaves its original quadrant and takes on new characteristics. This occurs when the procurement volume grows considerably. In this case, the region would shift upwards within the model and simultaneously receive a new value on the horizontal axis if the relation of both variables changes. Another cause can be the change of relation between proportional procurement volume and number of suppliers. This occurs when new suppliers are developed, even if the proportional procurement volume stagnates. The answers given in the interviews, which relate to the current situation, are visualized in the graph below. Western Europe, the home region, has special status and is depicted on a second axis due to its large proportion of the total procurement volume of the companies. South America, South Asia and the Middle East have a proportionally small procurement volume, while North America, East Europe and East Asia united have more procurement volume. It is remarkable that apart from the home region, none of the other procurement regions have a relation between procurement volume and suppliers that is smaller than one. Consequently, the majority of the regions have a large relative proportion of procurement volume and a relatively small proportion of suppliers. This could mean that the companies situate themselves differently in the various regions in order to be able to react to their individual circumstances and characteristics. Therefore, companies should generally adjust their procurement strategies based on the importance of the market. In the fourth quadrant, few procurement activities are concentrated on a few suppliers. These regions are possibly just now becoming important within the globalized procurement market. In the first quadrant, the procurement activities have been strengthened and result in significant volumes. The second and particularly the third quadrant show a stronger commodification – here, the procurement volume is distributed amongst a wider supplier base. Open for discussion is how possible paths of migration could proceed through individual sectors of this procurement model. With growing maturity level and importance as sales and production regions, it is conceivable that regions such as East Asia might approach Western Europe’s position in the diagram.